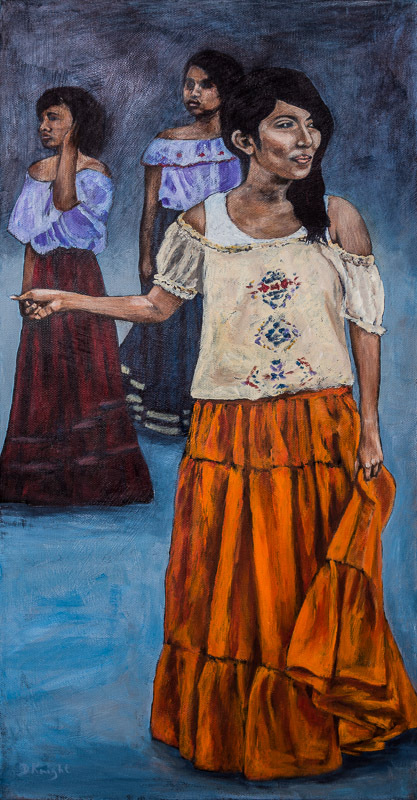 The last painting in my series is also from the Revolution Day parade in Todos Santos. These 3 young ladies are from the local high school. I love to wear long skirts and orange is my favourite colour, so naturally these girls caught my eye. My paintings of people usually have them all in the forefront. I tried to push the other 2 girls back in this one. Great new picture! I really like it. Hey – how about coming here for dinner tomorrow instead of going to the pub. We will just have a casual dinner but we can visit so much better than at the pub. 6:00 pm See you then!